The 15th Annual New Jersey Cup is open to US CLUB SOCCER-member clubs and teams in New Jersey. 10-11-12-13-14-15-16-17-18/19-and-Under boys' and girls' teams. 13-14-15-16-17U offers a Super Group (top, or most competitive) and a Premier Group. 18-19U are combined into a single 18/19U group. Super Group champions gain entry to US Club Soccer's National Cup finals. Premier Group champions gain entry to a National Cup Regional. ALL TEAMS MUST HOLD AND PRESENT US CLUB SOCCER PLAYER AND COACH PASSES AND A VALID, OFFICIAL US CLUB SOCCER ROSTER AT ALL NEW JERSEY CUP GAMES. .
NO USYS/NJYS passes/rosters will be accepted. INDIVIDUAL TEAMS JOIN US CLUB SOCCER IN ORDER TO PLAY IN THE NEW JERSEY CUP. Some groups will begin preliminary-round games in March 2019. Preliminary-round games can be played on the weekend or during the week. The semifinals/finals weekend will be June 1-2 in Tinton Falls. 15-16-17-18/19U play 80-minute matches: 2 x 40. 13-14U play 70-minute matches: 2 x 35. 11-12U play 60-minutes matches: 2 x 30. 10-U play 50-minute matches: 2 x 25. Overtime: if a game is tied after regulation play, the two teams will then play two, 5-minute, full-term periods. If the teams remain tied after overtime, the match will go to FIFA penalty kicks. Preliminary-round games can be played on the weekend or during the week. The home team is responsible for getting referees for their game through their club's referee assignor. The home team/club is responsible for assigning fees. The referees are paid whatever the home team/club normally pays referees for home games. The two opposing teams split the costs of the referees for a game. The home team must tell the other team in advance what the fees are and what their share is. Championship medals will be awarded to the winners only of each championship age group. Any player or coach who receives a red card in a New Jersey Cup match is suspended for the next New Jersey Cup game. 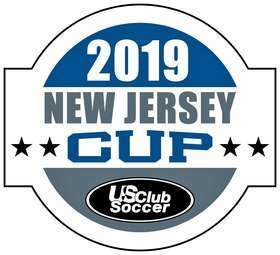 All teams participating in the New Jersey Cup must have valid US Club Soccer passes for all players and coaches at all games. A valid, official US Club Soccer roster also must be submitted to the referees at all New Jersey Cup games. Referees will be checking at every game. All players' names must be imprinted on the official roster; no handwritten additions. No NJYS/USYS passes or rosters will be accepted. Once a team is accepted there is no application-fee refund.